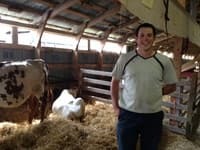 Young farmers across Quebec are descending on the Eastern Townships this weekend. This year marks a special anniversary of the 4H club And to celebrate, the 4H's Sawyerville chapter is hosting a provincial rally. Our Sarah Rogers stopped by the Cookshire fairgrounds to talk to organizers while they set up for the weekend event.